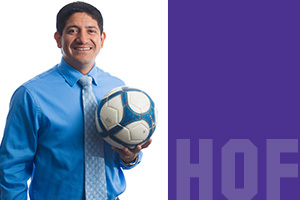 Rafael Arellano was a member of the Men’s Soccer team for the 1994 and 1995 fall seasons. The Woodstock HS grad was named to the Illinois Skyway Collegiate Conference Soccer First Team and All Region IV First Team in 1995. His teams finished with an exemplary 38-8 overall record. He was also named as team MVP in 1995 and a member of the first conference soccer championship. Rafael also played a vital role as a co-founder of MCC’s Latinos Unidos, a club which promotes Latino cultural awareness, ongoing support and assistance. He went on to graduate from NIU with a Spanish Translation/Business major. He has returned to campus to occasionally speak to the soccer team to discuss the importance of education and the carry-over of athletics to the classroom and life. He currently owns his own businesses, RAF Interpreting and Rafael Real Estate and Brokerage and resides in Woodstock with his family.